Is it worth upgrading from Windows 7 to Windows 10? You've been happily running Windows 7 for years, bypassing Windows 8 and all its teething problems, so why upgrade to Windows 10 just because it's free? Here we'll examine the reasons why now is the time to consider switching up, while also revealing some of the pitfalls that may make you think twice. You read it right: the obvious reason to upgrade is that Windows 10 is free until 29th July 2016. If your PC runs Windows 7, it'll run Windows 10 too – although check for potential compatibility issues with older programs and some peripherals like scanners and printers. 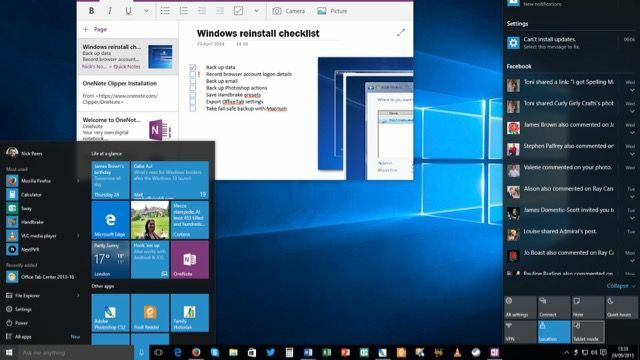 Windows 10 (and Windows 8 before it) are likely to perform better on your PC. Windows boots much quicker, power management is more efficient and it's been tweaked to feel more responsive too. That said, there are no obvious improvements to gaming performance, although there are lots of new features to enjoy, particularly for Xbox users. You'll notice Windows 10 follows on from Windows 8 in applying a flat, somewhat minimalist theme compared to Windows 7's translucent effects. This actually makes better use of screen space (window borders are smaller) and is less demanding on system resources. Windows 10 retains the best bits of Windows 7's desktop – Aero Peek for one – but introduces some handy tools of its own. There's Task View, which lets you view all open windows and spread them across multiple virtual desktops to reduce clutter. The new Action Centre is also an improvement, providing real-time notifications in a handy slide-out panel from the right-hand side of the desktop. Get past the frankly awful Start screen and Modern UI focus, and Windows 8's desktop contained a raft of improvements, all still present here. There's the brilliant File Explorer tool for browsing, managing and transferring files, for example, plus File History, which offers an alternative way of backing up your photos, documents and other key files. Don't worry though, because the old Backup tool has made the jump from Windows 7 too if you'd rather stick with that. Certain features in Windows 8 have been reimagined too – the App Store remains (now Windows Store), but apps run in their own resizable windows like regular programs rather than monopolising the screen (you can still run apps this way if you like by switching on Tablet Mode from the Action Centre). The Start menu is back in Windows 10, combining the best bits of both – the left-hand pane provides all the key shortcuts you need, and while the right-hand pane may not look stunningly attractive, it does provide a convenient customisable spot for pinning your most frequently used shortcuts. Oh, and don't forget the useful Quick Access menu (right-click the Start button to open it). Windows 10 places its search tool in full view on the Taskbar. This works in a similar way to the search box on the old Start menu, but covers your entire PC and makes it easy to refine your search as well as extend it to the web. Search also comes with Cortana, Microsoft's new virtual assistant, which can monitor your daily schedule to provide timely and helpful advice, news and updates. Windows 10 seems to want to collect and share a lot of data about you by default. You can disable these settings, but they're scattered about the system. Use a free program like O&O ShutUp10 to tame them all from one convenient place. Windows 8 introduced the concept of logging in with your Microsoft Account to sync settings between different devices. Windows 10 supports this – and certain features work best with a Microsoft Account (such as OneDrive or calendar integration). Not convinced? You can continue to use your traditional user account, and log in to your Microsoft Account only for specific apps. Some functionality has been removed in Windows 10, but you can replace most of the following with free software: Windows Media Center, a DVD video player, desktop gadgets, and the Microsoft games (Solitaire, Minesweeper and Hearts). Windows 10 is definitely an improvement over Windows 7 – there are problems, but they can be fixed. The key thing is not to rush: you have until 29th July 2016 to upgrade if you don't want to pay for the privilege, and remember – you can always roll back if you discover it's not to your taste.